E!’s Fashion Police, a show that was formerly hosted by the notoriously harsh Joan Rivers, has sparked controversy for a comment one of its hosts made about Zendaya after the Oscars on Sunday night. Zendaya is an 18-year-old Disney actress and musician who attended the 87th Academy Awards over the weekend, wearing a gorgeous white gown and rocking dreadlocks. Giuliana Rancic, an E! personality and Fashion Police host, criticized Zendaya’s hair on the show, which has since set the Internet ablaze. In her critique of Zendaya’s look, Rancic says, “She has just such a tiny frame that this hair, to me, overwhelms her. I feel like she smells like patchouli oil. Or weed! Yeah, maybe weed.” And, cue the fallout. Zendaya also explained, “To me locs are a symbol of strength and beauty, almost like a lion’s mane.” She suggested that Rancic (and anyone else who feels compelled to critique young stars of color for their natural hair) educate themselves before perpetuating harmful stereotypes. What do you think of what Rancic said? 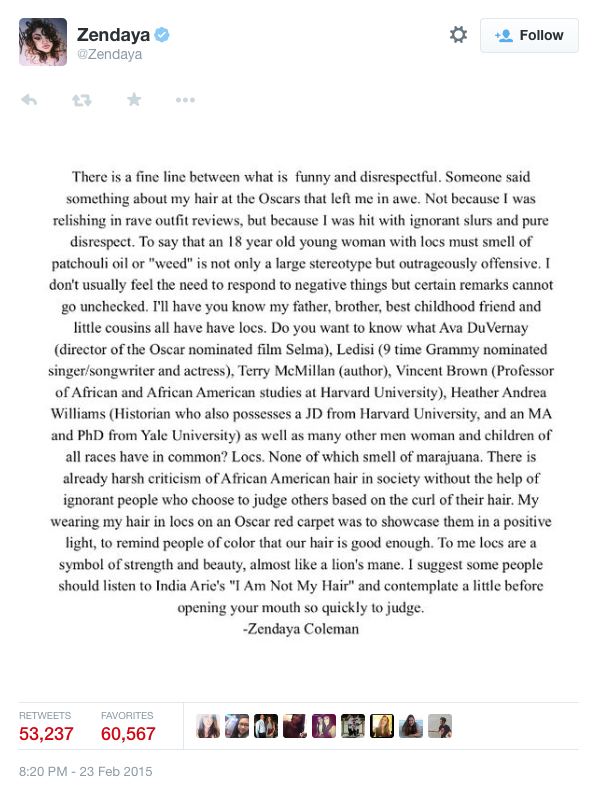 How do you feel about Zendaya’s response?